My husband forgot his phone so we had to turn back even though we’d already gone through 3 gates. There was no complaining or cussing, though, for when we headed back out our second time, we were greeted with the resplendent gift of the sky. It was as if we were in a dream of chiaroschuro; of lightplay and shadow. The whole world glimmered with Nevada’s silver and gold and we saw with new eyes the wonder and beauty and power of this country. 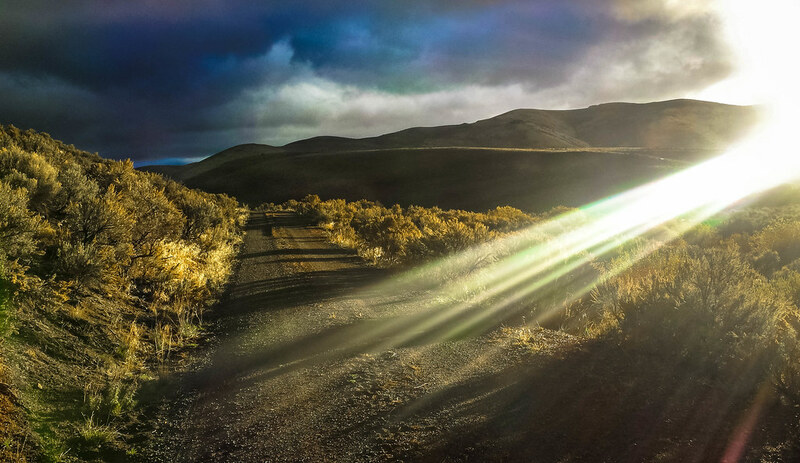 This entry was posted in The United States of America, Travel Photos and tagged clouds, country, gold, high desert, morning light, Nevada, Northeastern Nevada, ranch, ranchland, sagebrush, Samsung Galaxy S4, silver, sunlight. Bookmark the permalink. Aquileana, and thank you so much for the retweet! Stunning gallery… I can read many subtle messages in those clouds (and beyond them). Gorgeous!!! Clouds can disarm one easily…sweeping views! Beautifully put! I am so thankful for those “right place at the right time moments!” You’ve had many, too, I know! It is my pleasure, indeed! Thank you for such kind words. My very best to you! Yes, thank you so much for your comments! It was stunning to be in the midst of it. It’s sad that people dismiss Nevada and miss out on the beauty there. How lucky you were to have that moment in time. I love the first picture ! Thank you! Can you imagine – this just happened yesterday! My kind best to you!